Make Mexican Beef & Rice Casserole tonight: a tasty way to make a pound of ground beef serve eight. 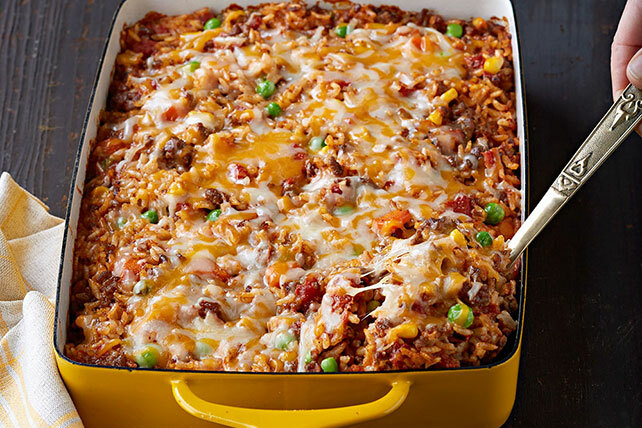 Mexican Beef & Rice Casserole also freezes well! Brown meat in large nonstick skillet; drain. Return meat to skillet. Reserve 1 cup cheese for later use. Add remaining cheese and all remaining ingredients to meat; mix well. Spoon into 13x9-inch baking dish sprayed with cooking spray; cover. Bake 40 to 50 min. or until rice is tender. Top with reserved cheese; bake, uncovered, 5 min. or until melted. Garnish this hearty casserole with chopped fresh tomatoes and cilantro before serving. Prepare using KRAFT Mexican Style 2% Milk Finely Shredded Four Cheese.